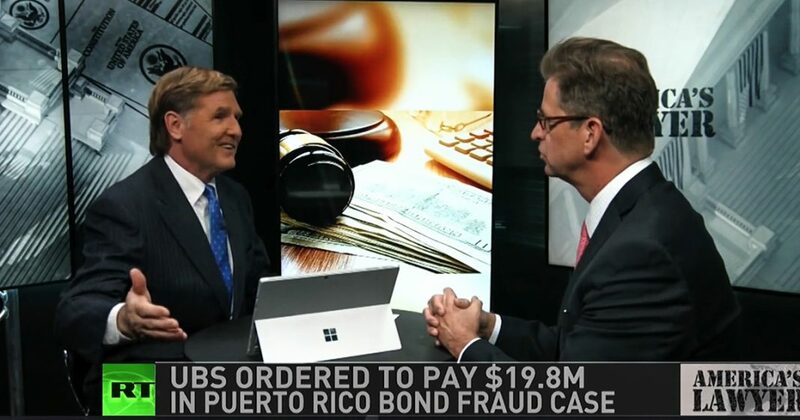 Via America’s Lawyer: Mike Papantonio talks with Attorney Peter Mougey, who recently secured a $19 million dollar verdict for a Puerto Rican investor last week against UBS. Click here to learn more about the $19 million award against UBS. Mike Papantonio:	Big banks have been praying on Puerto Ricans for years, selling them junk bonds and other toxic investments that the banks knew, absolutely knew would fail. Bankers pocketed billions of dollars and the victims lost everything. But now the tables are turning and more and more legal victories are being won against swindle investors. And I’m joined now by Attorney Peter Mougey, one of the people who secured a lot of those verdicts. As a matter of fact he just came back with a verdict for $19 million for this kind of scam that’s going down in Puerto Rico. Peter, I followed your career a long time and I know you’ve handled some of the biggest cases in the country. You have in the last year really been focused, last two years, really been focused on Puerto Rico. And the reason is, is the people have been treated so poorly down there. I mean, tell us a little bit about what was done to make this scam unfold and how many people affected by it? Peter Mougey:	It was a business model that the banks, investment banks, like UBS, Santander, Oriental. But in this case UBS used to capitalize on underwriting investments that they knew were problematic. And they took those investments and stuffed them inside of funds and then sold them to their own clients, knowing the entire time it was a house of cards. And they got out of it before it collapsed, protected their own interests, and passed on all the rest to their clients. It’s the same story, different day. Peter Mougey:	In Puerto Rico to date. Mike Papantonio:	In Puerto Rico. Peter Mougey:	This is 2014 since this last collapse over the last four or five years, this is the biggest verdict to date. Mike Papantonio:	Okay, let me add to that, the people who review this are arbitrators, they’re not even jurors. They’re people that for the most part work for the industry. Explain how that works. You present you to arbitrators. Who are they? They must have been really upset to give you this kind of money. Peter Mougey:	There were three arbitrators, two of them were lawyers and the third one was not, owned her own business. But the two lawyers had done everything from commercial work to labor, they had big diversified careers. And they took in all the evidence, they heard three weeks of testimony, over 300 or 400 exhibits. And you’re right. They heard the testimony, at the end of the verdict, and the were pissed. They were upset. 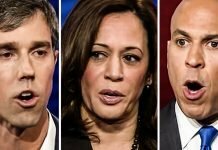 Mike Papantonio:	They had to be. 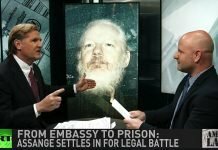 Peter Mougey:	I mean it was 100% of the lawsuits, attorney’s fees, costs, and post judgment interests, almost $20 million. Peter Mougey:	All of them have a long list. Mike Papantonio:	Yeah, but UBS, long history of doing this kind of thing. Now you caught them in Puerto Rico. Tell us a little bit about UBS and their past history. Peter Mougey:	You can come up with one example, whether it’s tax evasion, whether it’s conflicts of interest, but in this case what they did is they went to bond issuers on the island knowing they were in trouble. And they convinced them to issue more debt to get out of their financial problems. So they issued more debt, on top of more debt, on top of more debt which created this death spiral. $72 billion	worth of debt. By 2013 the commonwealth couldn’t pay even the interest payments and you started to see, just this implosion. And what really was disgusting about the conduct is the series of conflicts of interest. So they acted as an issuer, then they took the bonds into their proprietary accounts. And so they didn’t have to hold the risk. They shoved them to their own clients into funds. And then they sold those funds to their own clients. And all the while they reduced their exposure, UBS did. They shrunk their UBS exposure through leverage, through their proprietary accounts, and passed all of this risk onto their own clients. Never telling them that were significant problems. And actually to the reverse, they told them everything was okay, they told them they were collateralized. They actually had a label of capital preservation in safe, telling everyone everything’s okay. Mike Papantonio:	Everything’s good, don’t worry about it, your money’s safe. Now we talk about these big numbers. They scammed the island for billions of dollars, okay? But the people that got hit are mom and pop investors. We’re not talking about banks stealing from banks. We’re talking about banks stealing from mom and pop investors. Peter Mougey:	You’re totally right. And that’s what … It really shakes you up. Mike Papantonio:	What are some of the stories? Peter Mougey:	The stories are everything from taxi cab drivers that have been saving 50 bucks a week their whole life to fishermen. This one gentleman that we represented, the story it makes your heart, I mean it just … The guy left Puerto Rico as a young man, six years old, and was moved to New York. Couldn’t speak the language. And literally took himself from couldn’t speak the language in New York at six or seven years old, spent 10 years in college paying his way through. And then came back to Puerto Rico and got involved with McDonald’s. And over decades saved a really good bit of money, and then took that money and gave it to UBS and said, “This is my retirement.” Here’s a guy now in his mid 70s, about at retirement. And can you imagine, you see 70% of your net worth imploding after you were told it was safe. Peter Mougey:	We’ve been through 15 million pages of documents, we have, our firm has. 15 million pages, and have pieced together the story that we can tell in an arbitration, that the arbitrators are willing to give a $20 million … Not one phone call from a regulator or any law enforcement asking us what have you fond in that 15 million pages? Mike Papantonio:	Stay at it, keep sending the material, force them to do something. Peter Mougey, stay at this case. This is deplorable. Thank you for joining us. Peter Mougey:	Thanks for having me.